Not always considered in chart comparison are aspects in another dimension of the chart, and these are aspects in declination. When two planets are the same distance from the equator, they are considered parallel or contraparallel. The parallel occurs when two planets are the same distance from the equator and on the same side (both north or both south). The contraparallel occurs when they are approximately the same distance but on opposite sides of the equator (one north, the other south). If you need to learn how to find these aspects in declination, see our article here: Determining Parallels and Contraparallels in Synastry. Typically a one-degree orb is used. 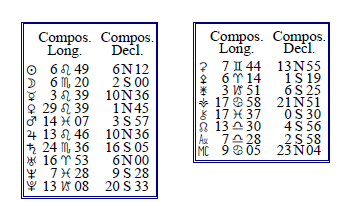 We have recently added a declinations ephemeris for the years 1940-2015 on Cafe Astrology here:Declinations Ephemeris 1940-2015 (pdf), which should come in handy for comparing positions between charts. Sun to Moon. This is a classic aspect in synastry. Connections between the Sun in one chart and the Moon in the other chart don’t guarantee a healthy relationship, but they do imply the potential for a strong connection or bond. Sometimes, there is a co-dependency feel to the relationship. Venus to Mars. Romantic/sexual attraction, competitiveness which can be stimulating. There can also be quite a bit of posing, cat and mouse, “foreplay” that is not always of the pleasant variety. Moon to Venus. Peacefulness, contentedness, acceptance, domestic ties. Moon to Mars. Potentially volatile but also potentially emotionally rich, stimulating, and exciting. The outer planets connected with inner planets almost always add complications, but with much potential for spiritual growth. Venus or Mars with Pluto are often indicators of sexual attraction. Venus with Pluto can be especially complicated. While there is usually a lot of attraction, it can be mixed with fear, and Venus-Pluto connections often have a love-hate feel to them as a result. Venus-Pluto and Mars-Pluto are usually at their best when they are played out in the bedroom! With Neptune, the Neptune person can have an effect of bringing tremendous highs and lows to the other person’s life as they struggle with their own dreams and ideals, seeing traits in the Neptune person in the extreme, bad or good, instead of realistically. There is often projection of hopes and wishes onto the Neptune person, and some level of disappointment when it is discovered that the Neptune person is a real, flawed person and not the embodiment of the other person’s ideals and fantasies. However, if the couple can move past this drama, the relationship can be spiritually uplifting. With Uranus, the Uranus person takes on the role of shaking up the other person’s life in some obvious manner, whether it’s about relationship expectations, daily routines, or ideas. The Uranus person may be seen as inconsistent–all there one day, not there the next, and this can be literally or figuratively speaking. The personal planet person might feel like the Uranus person is always somehow out of reach, and this can be intriguing or upsetting, and usually a bit of both. With Saturn, the Saturn person acts to remind the other person that they need to be responsible, and this “lesson” can be both rewarding and challenging, depending on how the Saturn person delivers these reminders, and on how the personal planet person receives them. With Jupiter, there can be a lot of leniency. The Jupiter person is usually quite permissive with the personal planet person, sometimes to the point of encouraging negative behaviors. However, there is quite a bit of acceptance and good humor between the two, and this can be very encouraging.